The free edition of TVersity is a great tool for sharing your media files with compatible UPnP or DLNA devices. What it does essentially is allow the media files on your PC to be played back on devices such as the PS3 or the Xbox 360, while presenting an easy to navigate interface. And the best part about TVersity is that if the media file isn't natively supported by the connecting device, then TVersity will automatically transcode the file for you in real-time so it plays without you having to convert the files manually. Quite a lot of our guides, such as the PS3 H.264 Conversion Guide, already included instructions for TVersity. It's becoming quite a pain to update each of these articles individually whenever TVersity changes, so I've decided to put all the instructions in this one tutorial and simply refer to this guide from those other guides. TVersity requires a connection to be made on your home network between the PC that you install TVersity on and the device that you wish to connect to the PC. While in most cases, this can be accomplished easily thanks to the UPnP/DLNA standards, sometimes some manual network configuration is require, such as being able to open ports on your firewall, or configure port forwarding. As every network device has a different way of achieving this, it becomes difficult to provide instructions for every situation, however the basic method will be explained and resources provided, which should allow you to find the precise instructions for your network device should you need to configure it manually. Hopefully, it won't come to that. Also, while the instructions in this tutorial are tailored for all UPnP/DLNA compatible devices, focus is placed on the PS3 or Xbox 360. Sometimes, your network router may also have an option to have UPnP enabled or disabled. How this can be enabled depends largely on your router/network device, so do a Google search for the model of your router and "UPnP" to see if there is an option to turn it on (on some routers, it is enabled by default and can't be turned off). 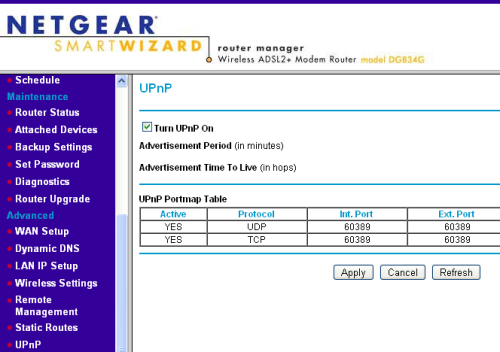 For example, on my Netgear DG834G router, there is an UPnP page that allows you to enable or disable UPnP (obviously, we want it enabled). You may need to restart your computer or router for the changes to take effect. Before we install TVersity, be aware of several requirements. If you need TVersity to do real-time transcoding, then your CPU will be used and as such, a powerful system is recommended. Most modern CPUs sold today should be fine. For transcoding of WMV video files, it is recommended you have Windows Media Player 11 or later installed. For the transcoding of other video files, it is strongly recommended that you have Haali Media Splitter (for OGG/OGM files), Real Alternative (for RM/RMVB files) and AC3Filter. However, installing these software individually may be troublesome and you may prefer installing an all-in-one codec pack which includes all of these tools pre-configured for easy installation - we recommend the K-Lite Codec Pack (Mega version, which includes Real Alternative). 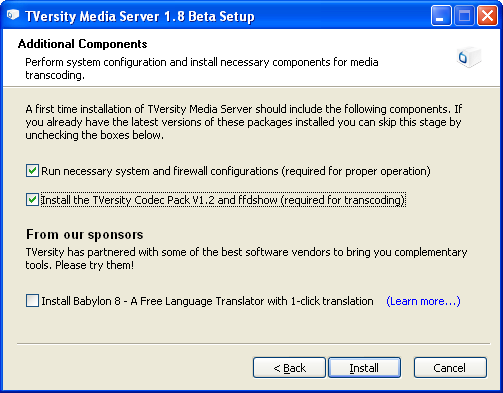 In any case, TVersity includes its own codec pack which is needed for transcoding of the most popular formats, so the choice would be to install a codec pack like K-Lite and *skip* installing TVersity's codec pack, or use TVersity's codec pack and then install the aforementioned tools (Haali, Real Alternative, AC3Filter) separately afterwards. Either way should work, and even installing TVersity's codec pack on top of K-Lite should work, although not recommended due to versioning conflicts. Download and install TVersity. Go through the installation (keep an eye on installing the Ask.com toolbar, because that's totally optional). After a few steps, you'll be presented with options to run system and firewall configurations (this option should be enabled) and whether you want to install the TVersity codec pack (see paragraph above). The sponsor installer option down below can be unchecked. Press "Install" and the installation process should start proper. Right at the end of the installer, you have the option to start running the media sharing service and the graphical user interface - keep both options selected. The media sharing service is what's run in the background to allow the media sharing, while the user interface is where you add in which media files are to be shared and also to configure the TVersity options, which the majority of this guide is about. If you get an error message about TVersity not being able to start, ignore it. Restarting Windows is not required. After the installer finishes, you should have a new Start menu folder for TVersity, and inside, there should be a tool called "Configuration Wizard". Start this tool. Inside this tool, you can choose to have TVersity start automatically at boot time, disable Windows SSDP service which may be required under Windows Vista due to TVersity using it's own SSDP service and it conflicting with the Windows one. Check the "Set Windows Firewall to allow ..." option to configure the Windows firewall (if you're using it) so that the required ports are opened for you (more on that later). Then finally, you can set up which of the default Windows media folders are selected for including within TVersity for media sharing. Press "Configure" when you're done and then continue until the wizard is closed. At this point, TVersity should be up and running. Look for the TVersity tray icon, if it is greyed out instead of looking like below, right click on it and choose "Start Sharing" and wait until the icon turns colorful (if the TVersity tray icon is not shown, go to your Start Menu and start TVersity from there).